True to the motto “Business is made with people”, COMM-TEC GmbH is again following its communication approach in 2019 and presenting its extensive product portfolio and services on around 200m² – hands-on and interactive! Increasing digitalization and increased efficiency are leading to more and more changes in workplaces, offices, and technical requirements. Technical equipment and infrastructure are undergoing a shift, as are employee work processes. New presentation technologies and collaboration systems increasingly guide and support us in our daily office work. COMM-TEC, as a value-added distributor operating across Europe and with more than 40 brands in its portfolio, stands for “think solutions” as well as innovative strength and know-how. In 2019, COMM-TEC will again present its trade visitors with highlights and trends, products and practical scenarios from AV media technology. Technology you can touch! In addition to the latest developments and applications from the collaboration and BYOD divisions, COMM-TEC is presenting its innovations and highlights in the areas of large displays and touch-capable videowalls – productive, interactive, and intuitive in use. Smaller, quieter, and brighter – this is the new generation of projectors. Other highlights at the 2019 COMM-TEC booth are innovative solutions on the topic of digital signage, for example exclusive digital signage players and all-in-one solutions, as well as players that combine sensor technology such as motion and proximity sensors with visitor tracking. In addition, COMM-TEC helps visitors to experience the latest APP for ultra-thin e-posters, as well as award-winning display, steles, recording, and streaming solutions in the area of education. The next generation of room booking systems proves itself with its new features and application possibilities. The efficient use of conference rooms conserves resources and saves money. COMM-TEC is presenting innovations and developments, such as new e-ink door signs, from 3 manufacturers. With respect to office equipment and conference technology, COMM-TEC is presenting well-designed and practical highlights from the area of retractable displays to high-quality equipment for offices and work spaces. Another focus is control solutions for conference rooms, building automation, smart homes, and home theaters. The range of products is rounded out by amplifiers, zone mixers, indoor and outdoor loudspeakers for every need, from background sound systems to the conference room and home cinema. COMM-TEC also provides state-of-the-art solutions for AV signal transmission in the conference room and over the entire network via “AV over IP”. 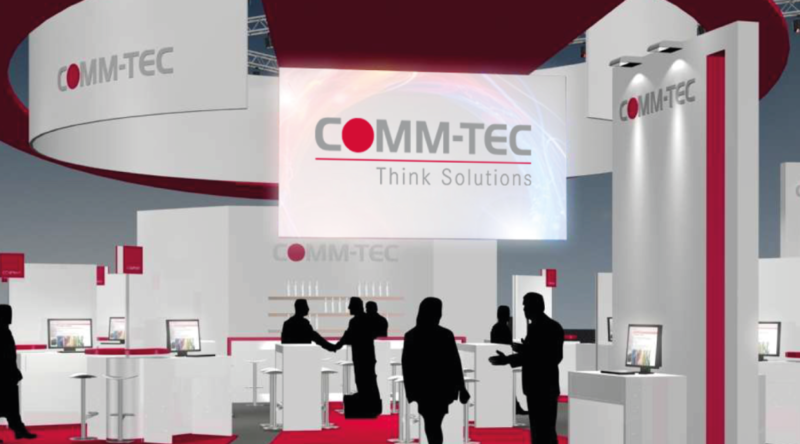 For a personal meeting and networking, COMM-TEC invites to a booth party on February 5 from 5.00 – 7.00 p.m. – Hall 2 / Booth B40.